How to get there: This mountain is located in Kvinnherad, a small community east of the Hardangerfjord. This area has some of the most alpine peaks in Hordaland, between the fjord and the glacier Folgefonna. From Bergen, one can drive in about 1.5 hours to Gjermundshamn where a ferry crosses to Årsnes (previously Løfallstrand) in Kvinnherad. Continue south for 5 km to the small village Rosendal. Turn left in Rosendal and follow signs reading "Baroniet". The road will take you right through a stone gate, the Baroniet building is on your right. A bit later, there is a road that forks left going uphill. Do not take this road, but continue on the main road until the next road fork where there is parking on the right hand side of the road. You should see the creek coming down between Melderskin (1426m) and Laurdalstind across the road (to the north-east). Route description: This route describes a "Grand Tour de Bjørndalen" including the highest peak in the area, Juklavasskruna, along the route. The first part of this route is described under Bjørndalstindane (1426 m), thus this description starts at the highest summit of Bjørndalstindane. From this summit, (GPS: N 59:59.812, E 006:06.971) the route continues along a jagged ridge. 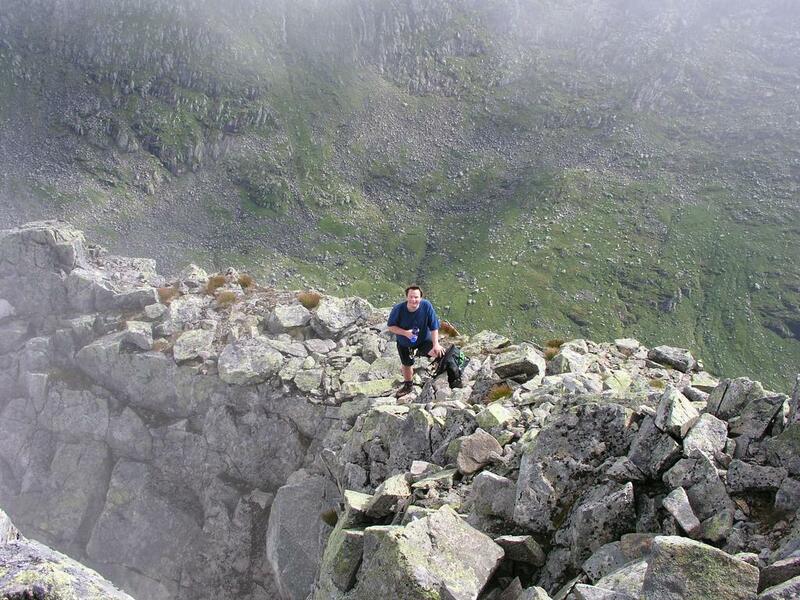 The first part of this ridge looks rather intimidating when viewed from the 1426 meter cairn, see the picture below. However, the route is simpler than it appears from this viewpoint since the south side of the ridge is more gentle. 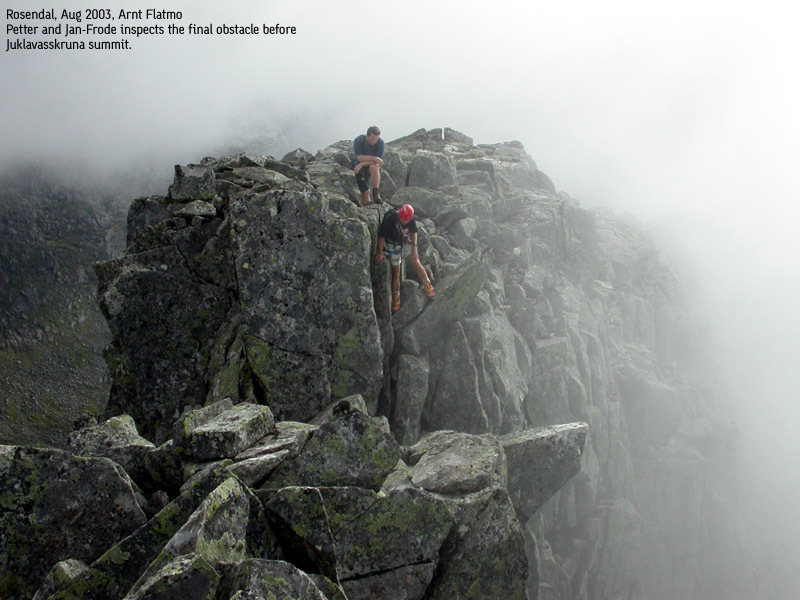 The entire route across to Juklavasskruna never exceeds (YDS) class 3 in difficulty, a rope is generally more of a problem than help provided that the party is careful and do know what they are doing. First descend while passing a couple of rock spires on the right (south). The terrain has some loose rocks, so care is needed when if there are people below. Whenever the ridge itself becomes too difficult, stay right (south). In this way you will reach a first saddle connecting to the highest peak on this part of the ridge, here called Bjørndalstindane, summit #2. 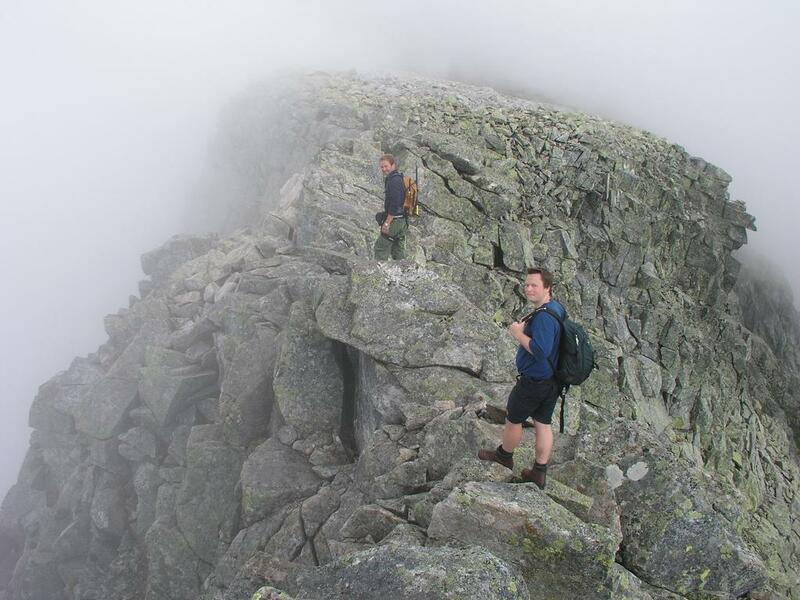 This saddle is perhaps 1380 meter, leaving this second summit unranked. Continue scrambling across the high ridge on solid (but narrow) rock and proceed to climb the tiny summit #2. This summit has GPS coordinates North 59:59.838, East 006:07.153, with an estimated elevation of 1420 meter. It is part of the fun to climb this subsidiary peak and look back towards the highest point that you just left. Again, the terrain that you just crossed (without much difficulty) looks quite jagged and difficult as seen from this fine vantage point. The route is by no means concluded. Continue on top of the ridge down towards the saddle that defines the primary factor of Bjørndalstindane relative to the higher Juklavasskruna still ahead. This saddle is 300 meter away with GPS coordinates North 59:59.864, East 006:07.324. The GPS elevation of this saddle read 1330 meter, exactly 100 meter lower than the first summit. If the first summit is 1426 as the map indicates, then the primary factor is most likely just short of 100 meter. Given the inaccuracies of the map and the GPS readings that we obtained, we soft rank Bjørndalstindane assigning a primary factor of 100 meter. Looking ahead from this saddle, the ridge that extends from the Juklavasskruna side ends abruptly in a very steep cliff. To climb this head on is technical and likely to take more time than a single day hike permits. Thus, the route continues on the right side of this obstacle, there is a distinct grassy ledge climbing upwards that can be easily followed. Continue an ascending traverse around following several more grassy slopes and ledges, then climb up among larger rocks and cliffbands to regain the top of the main ridge. Follow the top ridge as it curves slightly in order to reach the highest point of Juklavasskruna, 1455 meter and coordinates N 60:00.028, E 006:07.816. There is one distinct point just before the summit where care is needed, descend on the left (very steep) side and move back onto the ridge around a rather large block. From the summit, the ridge continues further, with no particular difficulties until the broader, flat plateau of Juklavasskruna is reached. Another cairn is located near the cliffs to the north, this is the point marked at the map as 1434 meter, coordinates N 60:00.193, E 006:08.190. In order to complete the "Grand Tour de Bjørndalen", proceed east on the broad, flat plateau of Juklavasskruna, with the steeper drop into Bjørndalen on your right. 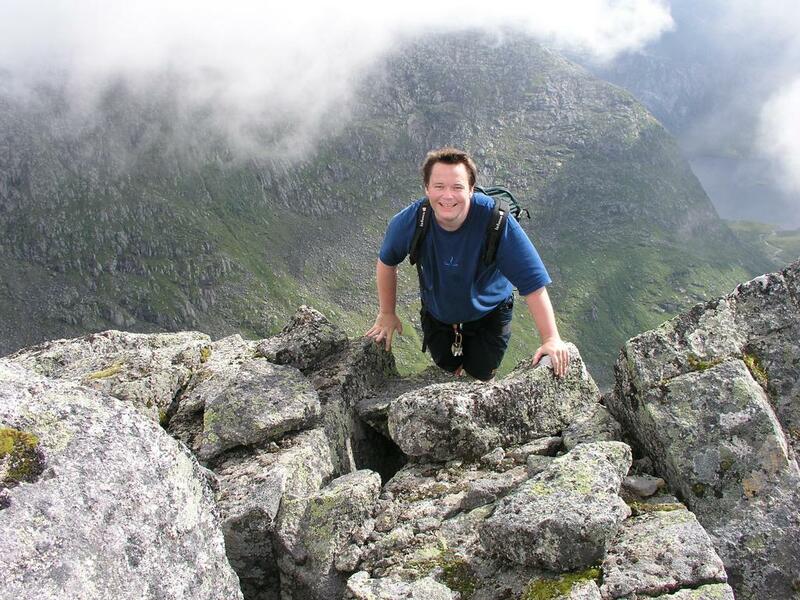 Locate the broad ridge that secends south directly towards the long, elegant ridge called Bjørndalsnuten. This ridge forms the southwest side of Bjørndalen. Descend about 200 meter and reach the saddle before a very gentle ascent along the ridge. The Bjørndalsnuten ridge has two unranked summits above 1200 meter and a cairn located at a low point near the saddle between these summits. The coordinates of the thw summits are N 59:59.251, E 006:08.418, and N 59:59.031, E 006:07.838. The first one is highest at about 1230 meter the horizontal distance to the second summit being about 700 meter. From this ridge there is a very good view across the valley to the long ridge connecting Bjørndalstindane and Juklavasskruna. Descend into Bjørndalen north of this second summit, some care is needed, the slope is easier further right. Once in Bjørndalen, follow the creek and cross it before Øravatnet (632 m). Continue to Stølsvatnet (630m) and the very nice mountain huts called Bjørndalen. From here, there are two trails back to your point of departure. Option one is to follow the trail that ascends about 200 meter to get back to the trail that was used before climbing Andersfjellet (see the route to Bjørndalstindane). The alternative, and recommended option is to take the trail (not marked on the map!) passing Isorvatnet (621m) and Prestavatnet (610m) down to Murabotn at the end of Muradalen. This trail has two fairly new suspension bridges crossing the river, the first right next to Bjørndalen. The descent to Murabotn is rather steep, but the trail is well marked and has a chain and a few man made steps in place to assist the hiker. Once you reach Murabotn, an easy hike along the road back to the parking is all that remains. Comments: This route deserves a "classic" status. It is perhaps the finest high ridge route in all of Hordaland. 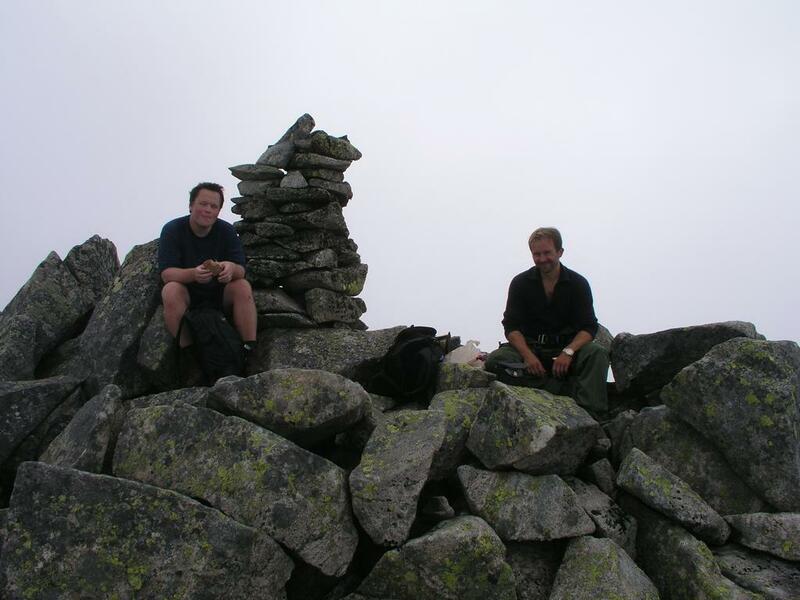 I did this hike with my friends Arnt Flatmo and Jan-Frode Myklebust. We started around 0930 and returned to the car at 2130, a total of about 12 hours. We kept a very slow pace at the end of the day, strong hikers can complete the described hike several hours faster, but this is a rather strenuous hike that should not be underestimated. One should note that the map is not entirely accurate in this area. In fact, the highest point of Juklavasskruna at 1455 meter is not marked on the map, nor is there any 1440 meter contour line. From the map one would easily believe that the point 1434 (GPS coordinates North 60:00.193, East 006:08.190) is the highest. However, this point is 400 meter to the northeast of the true summit. Moreover, the second summit of Bjørndalstindane is marked on the map with a generous 1420 contour around it, indicating that it might be as high as the first summit. This is not the case and the summit is indeed quite small, we estimate this summit to be no higher than 1420 meter, most likely slightly lower, assuming that the 1426 meter elevation of the first summit is correct. On the ridge east of the second summit. Regaining the ridge west of Juklavasskruna, Jan-Frode is enjoying the good scramble. The last obstacle on the ridge to Juklavasskruna. The summit of Juklavasskruna, Arnt and Jan-Frode. The last part of the ridge connecting the Juklavasskruna summit with the larger plateau. The ridge traverse from Andersfjellet across the 1223 hump, the two summits of Bjørndalstindane, the ridge to Juklavasskruna, as seen from Bjørndalsnuten (across the Bjørndalen valley).